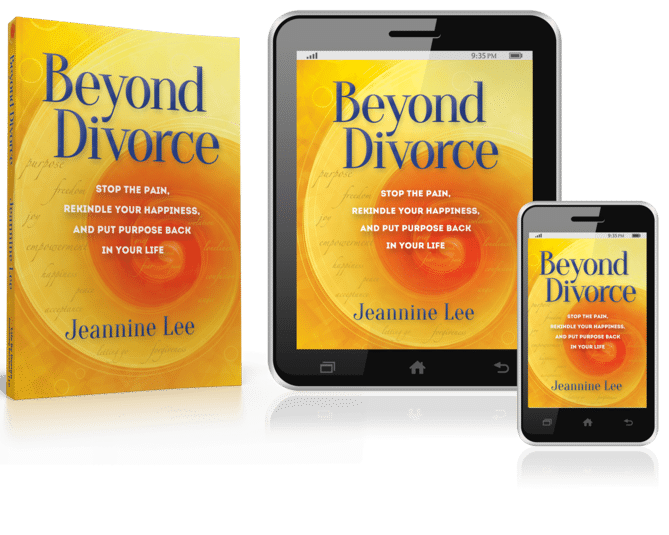 While writing my Beyond Divorce book, I identified 5 Turning Points we experience getting through the divorce process. Although each of us is unique, and each marriage is unique, these 5 turning points are common to everyone. We have to accept that its happening and love ourselves through it. We have to be real with our emotions and quiet the stories we tell ourselves. We want to lear what’s wrong in order to make sense of our experience. And of course we want to follow through with personal discovery of who we’ve become through the process so we can rebuild a life based on the things we value today. There’s another benefit. Knowing the turning points helps you pinpoint where you are in the process. For example, you won’t be able to dream of your new life (Step 5) while you are still overwhelmed by irrational thinking and emotional upheaval (Step 2). There will come a time when you become curious about who you are and what is next. When that happens you will know you’ve entered Step 4. It’s tempting to want to rush through the steps and get to the end. It’s a very human thing to do. But don’t. Be care-fully with each step. Each one is required in order to get well. I’ve designed by divorce recovery system is based on these turning points. It’s silly and harmful to go through this alone. 1. Honor yourself: You are going through a difficult life experience. You need to practice extreme self-care. Own the experience as yours. Honor it. Love yourself through it. You need a champion in your corner and it makes sense that it be you, first and foremost. Honoring your process and taking care of yourself is vital, especially in the initial stages. 2. Calm your emotions and thoughts: This is part of honoring yourself. Your emotions and thoughts are working overtime right now. As your internal messengers, they have a lot to say. You won’t always understand their message. Be empathetic toward them. Embrace them as if they were a hurting child; they are a part of you. 3. Learn what went wrong: Part of calming your emotions and thoughts, is understanding what you could have done differently. Emotions and intellect are different. Sometimes, when the mind can understand, the emotions don’t have to be quite so loud. There are common reasons that relationships end. Knowing what they are will help you feel more solid, and bring you hope. 4. Rediscover yourself and reclaim your power: The hope you gain from taking care of yourself, calming your emotions and thoughts, and understanding what went wrong, will give you energy to embrace the new possibilities unfolding around you. Discovering yourself anew is an adventure, potent with discoverable desires and passions. 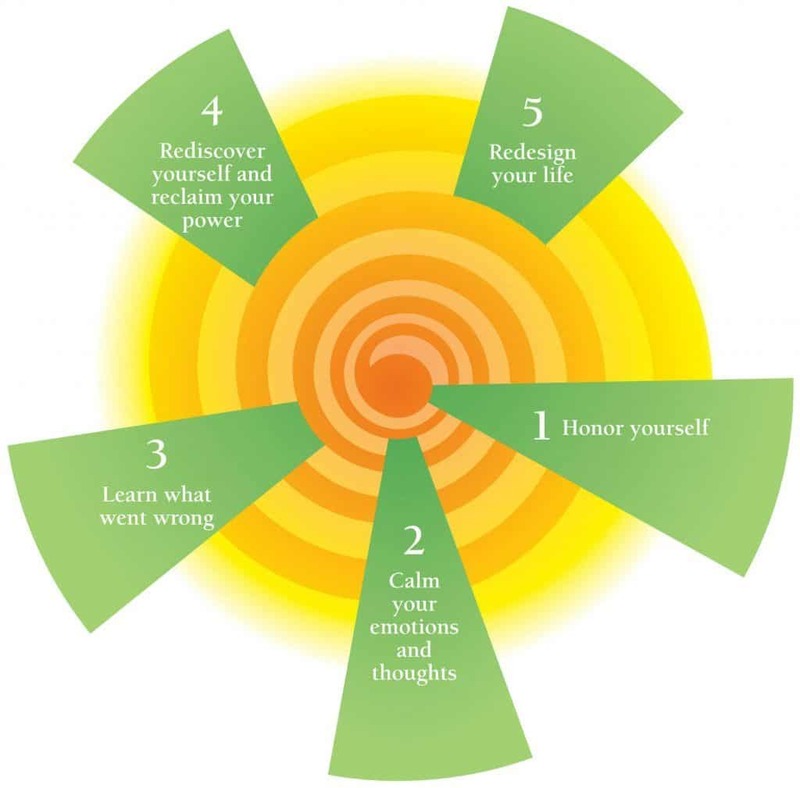 Reclaiming your power sets you solidly on the path of creating a new life you love. 5. Redesign your life: It is at this turning point that you will take the new you for a test drive. It’s brand new. Just like driving with a clutch the first few times there will be some starts and stops. You may feel a little foolish but it’s all worth it. It’s the only way. Taking charge of our lives is a big deal. It’s exciting and full of potential. This is where you begin to create a future worth having. Each of these Turning Points is unique in the way it feels, what it will require of you, and what it will teach you. I think of these turning points like points on a spiral. Spirals are beautifully proportioned, graceful shapes found in nature—in shells, sunflowers, and the spiraling of leaves growing toward the sun. Spirals represent growth from the inside out—from tight in a bud to full bloom. Your journey will also be from inside out, from a constricted place of pain that holds tightly to itself, to the spaciousness of having your feet spread wide and your arms raised high when you are truly beyond divorce. You may loop back through one or several of these turning points more times than you like. I hope you won’t become too discouraged when that happens. It’s a necessary part of moving beyond divorce. I assure you that when you do revisit a turning point it will be with more resources than you had prior, which means it won’t be as intense, and you won’t stay as long. Think of it as a revisit to tidy up more loose ends. 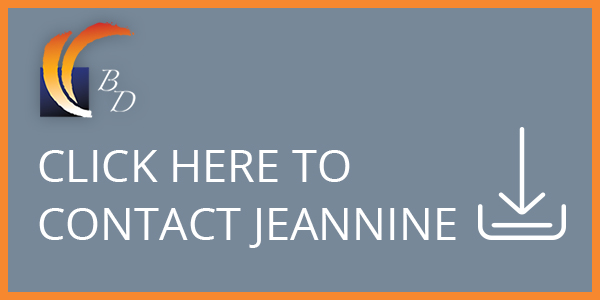 I point out the turning points as markers in my book, Beyond Divorce: Stop the Pain, Rekindle Your Happiness, and Put Purpose Back in Your Life, so you will know which you are traveling through. The book is designed to move readers through a healing process organically, and at their own pace, as a result of working through the chapters.